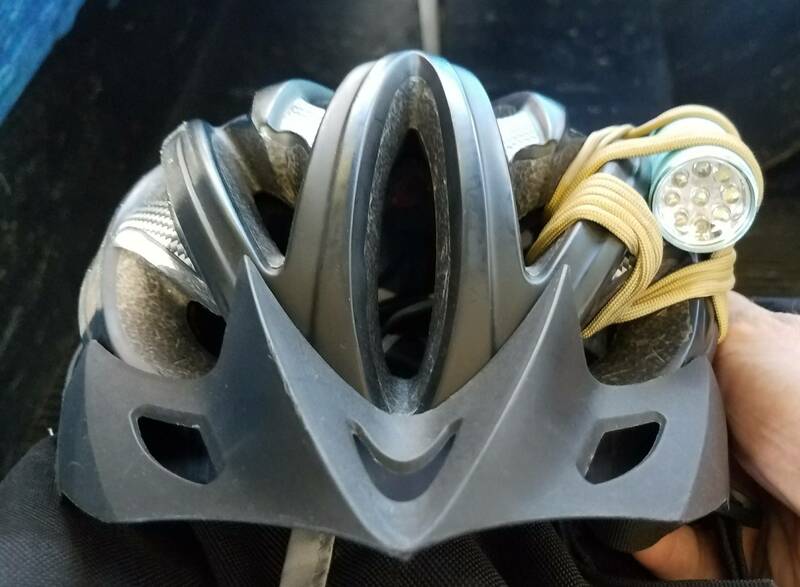 Everything I've found online discussing this has focused on the benefits and dangers of attaching a metal mount to the helmet, on which a flashlight would be attached. 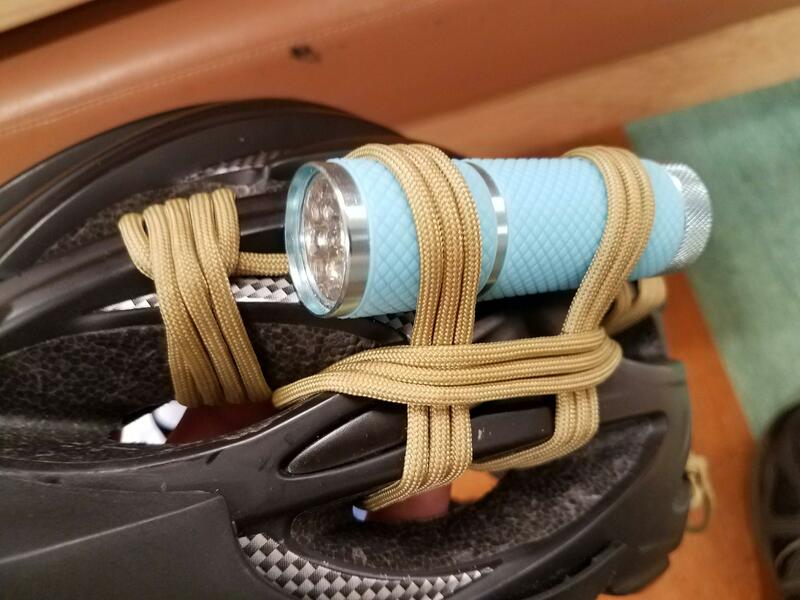 I'm using a soft mount (specifically paracord), and I was unsure if the flashlight itself presented a hazard in a crash. Front view, showing placement. It's offset so it's aimed a bit better at were I'm looking. All of the mounts from reputable manufacturers thatI’ve looked at are either rubber or Velcro or have a quick release that’s designed to tear free on impact. Paracord is incredibly strong - some have a tensile strength of over 200 kg /550 pounds. The concern is that your head might hit an object (such as a low tree branch) and the light or mount will snag on it, whipping your head and neck back. The neck vertebrae don’t like this motion. Also, in an accident the helmet is designed to slide along the ground preventing torque to the head. Your paracord might also snag and cause the helmet to torque your head. Note it would take a freak accident for this type of injury to occur. An individual might be fine with accepting this type of risk personally. A manufacturer who has domestic assets that could get seized in a lawsuit might not be willing to accept the risk, thus they err on the side of caution. On this forum, we can’t say “it’s fine” — that’d be negligent but we could say that many people would find the risk acceptable but ultimately it’s your call. Tl;dr: ideally, you’d want your mount to have a full break-away design. There are many helmet mounted lights available in the market. Yes, as @Paparazzi mentioned, this should be fine. I personally find this makes the helmet slightly heavy and prefer handlebar lights. Not the answer you're looking for? Browse other questions tagged safety helmets headlights or ask your own question. Does helmet padding contribute to the safety of a helmet?